It’s very easy to set up a WordPress website. In fact, you can do it in moments once you know how. Wealthy Affiliate helps you learn how to build a website, and the process is surprisingly quick and easy. You do NOT need to be technical to be able to do it. Trust me! 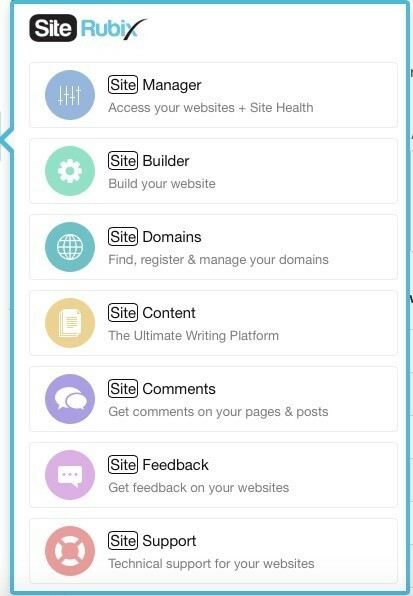 Here’s a snapshot of the modules that are available to you, with the free starter membership, that will have you up and running with your very own website in no time. By following the step by step training, you will have your very own website. 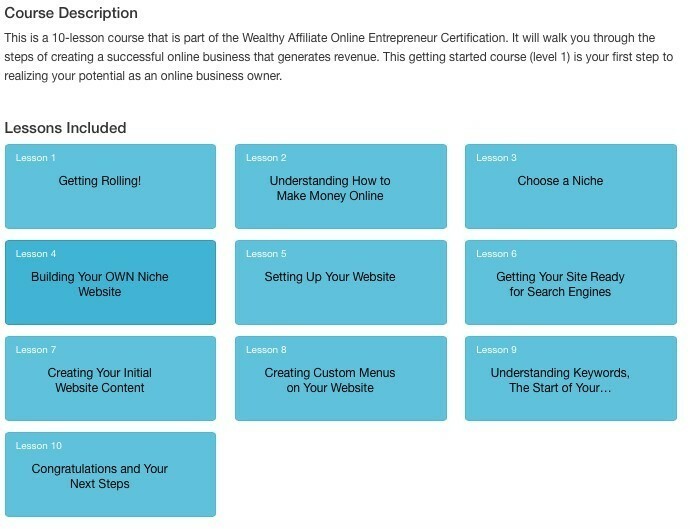 I will break down the steps for you here that are contained in Lesson 4 “Building Your OWN Niche Website”. As a Wealthy Affiliate starter member (the free membership) you can have up two FREE websites fully hosted. You can also choose to purchase your own domain, and whilst that is desirable, that can come with time. For a starter member, your free website will be on the .siterubix platform. As a premium member, you can create 25 free websites, and another 25 sites on your own domains (that’s FIFTY sites). To show you how easy it is, I’ll create a free domain, and take screen shots to show you the steps. I’m prompted to come up with a name for my website, and a title. Key in a domain name for your site. If your top choice is gone, keep going until you find one you’re happy with. This will be your website’s URL. Don’t put spaces in your title. Just say I want my niche to be all about pugs, because their little squishy faces and snorts and just so ridiculously cute. Lucky for me, my first choice of domain name was available. I have chosen “pugsrock”. Your website name should match your domain. It does need to be gramatically correct and have spacing. 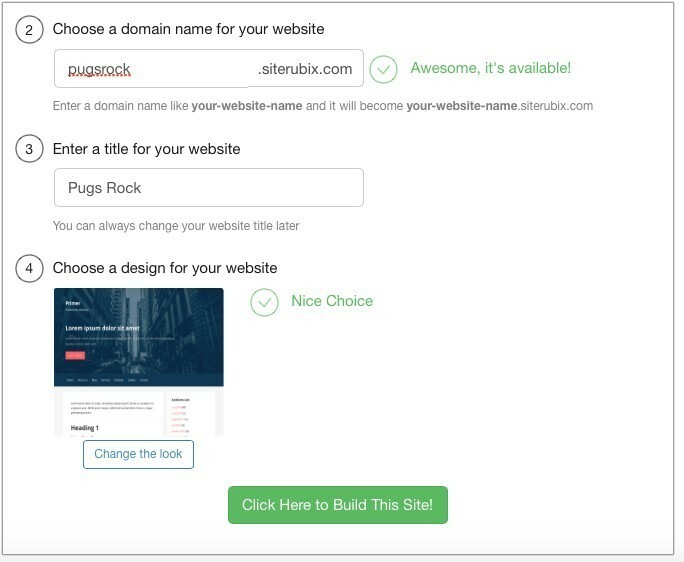 My domain is “pugsrock” and my website name is Pugs Rock. You will be promtped to choose a theme. As a starter member, there are 12 quality designed themes already loaded up for you, you just need to go through them and see which one you feel is most suited to your website. As a premium member, you will have access to 2,700+ themes to choose from. Simply choose the design you want, and now you’re ready to go!! Click here to see the “How to create a website in under 30 seconds” video. Lesson 5 goes on to explain, step by step, how to set up your back office, and add the plugins that you need. Before long you will have a website that will be the foundation for your very own business. Every business needs a website. Whether you have an online business or not, a website is an absolute MUST. You do not need to engage someone to do it for you (unless of course you can afford it and you want to). Hopefully you have seen that literally anyone can set up their own professional website very simply and affordably.